Warning: do not attempt to drive or operate heavy machinery while listening to Rimsky-Korsakov’s Scheherazade for the first time. Said composition is known to have caused feelings of extreme uplift, a dreamlike state, mild disorientation and a disassociation with the mundane. Use with caution, not to exceed ten listens per day, unless ordered by your doctor. Where to start? Shut your eyes as you listen to Scheherazade and the mind fills with vivid images: a turbulent ocean, eighteenth-century clipper ships with billowing sails, sailors and dashing sea captains saving the day. Musical colors and textures alert you, seduce you: the booming, ominous tones from the brass section (a tyrannizing Sultan) and the sweetest, most delicate violin presence possible (the lovely Scheherazade). These two voices help tell the story throughout the composition — which, although your ears want to tell you otherwise, is not a symphony, but a symphonic suite. 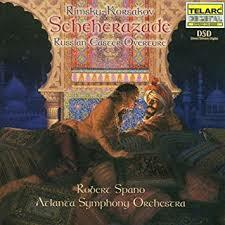 Allow me to share a teaser, before we delve into details about Rimsky-Korsakov and the story behind Scheherazade. Now, you might look at the title of the embed below and say, “Wait. 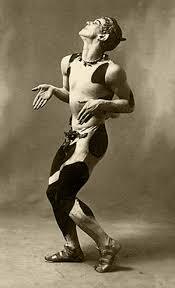 That’s National Ballet of Canada performing John Neumeier’s Nijinsky. We’re here to learn all about Scheherazade and its composer, right?” Trust me here. It all connects in the end (in a way my ballet readers will love). Rimsky-Korsakov’s Scheherazade is a bit like the 2010 film, Inception. It’s a story inside a story, or more precisely, the medieval Arabic collection of stories (1001 Nights, also called Arabian Nights in English). It’s about a storyteller who tells the Sultan a story a night for 1001 nights and thus saves not just her life, but the lives of all the young women in the kingdom. See, the medieval Sultan, a rather difficult, vengeful dictator type, had decided, following his first wife’s infidelity and subsequent beheading, to marry a new virgin each day after beheading the previous day’s wife, to guarantee no further such infidelity (and bruised ego). 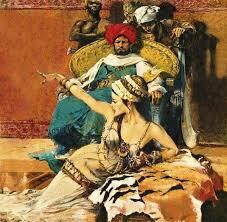 Scheherazade, a young, intelligent, resourceful type, actually volunteered for the job. She was clever, and understood the power behind good storytelling. On her wedding night, she started her story and got the Sultan all wide-eyed and absorbed. As dawn broke in the eastern sky, she made sure to pause her story at a cliffhanging point. The Sultan begged her to continue, but she only smiled coyly and said, “Tonight.” The Sultan, so intrigued, decided not to behead her, so as to hear the story’s end. Of course once Scheherazade finished her story that night, she started a new one right up, which once again reached a cliffhanger plot point at dawn. And so on, for 1001 nights. Now on to the composer, who had an unerring ability to take music and create a powerful sense of story with it, through it. Nikolai Rimsky-Korsakov was born in 1844 to parents who’d surely thought they were done with parenting. His father, Andrey, was sixty and his mother, Sophia, was forty-two. Their only other child, a son named Voin, was 22, already established in a career as an officer in the Imperial Russian Navy. Andrey and Sophia probably looked at the gurgling little Nikolai and thought, “Yikes. What now?” Fortunately, Voin was charmed by the little fellow and agreed to be his godfather, a position he took quite seriously, becoming more of a third parent than a sibling. Since Voin’s career kept him away, often at sea, letter writing became common and frequent among the Rimsky-Korsakov family, all of which were diligently saved. Wonderful for us now, because facts and minutia are there in letters, archived, for us to glean countless details about young Nikolai’s young life. 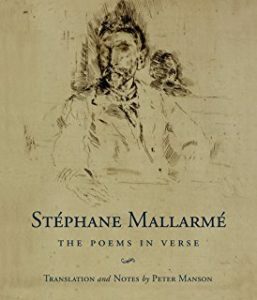 It’s not often we of the 21st century are privy to this intimate and thorough a glimpse of a composer’s early life. Music, we learn, was to only be a hobby for the young Nikolai. Everyone wanted him to follow in Voin’s (as well as his uncle’s and great-grandfather’s) footsteps, have a career in the navy. Nikolai, starry-eyed with admiration for his older brother, was happy to comply. Which meant leaving his doting parents behind in 1856 at age twelve for the Naval College in St. Petersburg. There, he coped with discomfort, homesickness, worked diligently, and followed Voin’s every directive. Once Nikolai’s progress was deemed satisfying, with good grades and responsible behavior, he was given permission to indulge in piano lessons, which he’d started back home. Nikolai had an ear for music, a natural talent. Unfortunately his first tutor was a cellist, rather uninspired in both teaching and playing piano. When, in the spring of 1859, the tutor admitted to Voin that Nikolai had grown better than he on the piano, Voin found his brother a new tutor: Fyodor Kanille (also spelled Théodore Canillé), a talented pianist and teacher, who instantly recognized his new student’s gift. He and Nikolai thoroughly enjoyed each other’s company, the lessons, the boy growing ever more enraptured by music, the piano, even fledgling attempts at composition. But when his grades began to suffer, Voin stepped in and said, “Whoa, whoa, too much interest in music. Stick to your naval studies. That’s your career, and we expect you to make top grades in your studies. Music is not your future.” He canceled the music lessons, and Nikolai, bereft, being the obedient boy he was, complied. Fortunately, the grades went back up and months later, Voin cautiously agreed to lessons again. One notable thing during Nikolai’s time with Uninspired Cellist tutor guy was that in the fall of 1857, one of Voin’s friends took Nikolai to see professional opera for the first time. A mere day later, the friend took him to a second, even more elaborate production. A fierce love for opera, this place where classical music meets story, took hold in Nikolai, a love for music and story that would power his future, his music-making, for the rest of his life. Time to hear the music in question. You have a choice here. The first embed is one of Russia’s top conductors, Valery Gergiev, leading the Vienna Philharmonic (think: smooth, nuanced, old-world sound, performed by a whole lot of white men). The pace speeds along at a fast clip in a performance lasting 42 minutes. The first and third movements are amazing. Do NOT miss. The next one is its musical opposite. It’s the Gimnazija Kranj Symphony Orchestra, apparently a youth orchestra, in Ljubljana. Slovenia. A really, really good performance. Ah, youth. Such beautiful faces and expressions (Gergiev is a tiny bit creepy to watch, I have to be honest, as much as I admire the man — and all those white male faces in the orchestra start to blur together). This version below, conducted by Nejd Bečan is quite slow (too slow?) and stretches to 51 minutes. The solo violinist here, Matjaž Bogataj, is divine. He had no formal conservatory training, but in spite of that, at age 27, he was hired as a professor of musical composition, harmony and orchestration at the Saint Petersburg Conservatory in 1871. Never one to look for a free ride, he educated himself thoroughly, for years, until he became a master of Western methods, incorporating them into his work. He was a member of “The Five” or “The Mighty Five”, a group of Russian composers (Balakirev, Mussorgsky, Borodin, Rimsky-Korsakov, César Cui), who, in a nutshell, rejected the compositions of Haydn, Mozart, Beethoven, etc, in favor of “Russian” classical music (largely composed by them), thus influencing the classical music that came out of Russia, imbued with nationalist identity and rich with folkloric elements. Nikolai’s brother Voin was, for quite some time, the better-known Rimsky-Korsakov, a respected navigator and explorer. There is a small archipelago in the Sea of Japan named after him. He died at age 49. His wife, Nadezhda, was very accomplished on the piano and played a far more important role in Nikolai’s life than history will likely ever give her credit for. Think Clara and Robert Schumann, minus the insanity. He maintained a career as naval officer and managed to compose and spend social, music-centric evenings with The Five. In 1873, the Imperial Navy wisely created the civilian post of Inspector of Naval Bands for him. This kept him on the Navy payroll but allowed him to resign his commission and stay put. He continued to serve in this position until late 1883. He was prolific in his composing and produced 11 symphonic works (which included Scheherazade, “Capriccio Espagnol” and 3 symphonies), 15 operas, 3 concertos, 79 Romances. He was prolific in the fathering department, too. Seven kids. He composed the “Flight of the Bumblebee,” originally for his opera, The Tale of Tsar Saltan. Its piano version is famous. Don’t ask for a link. It’s too busy and gives me a headache. He put countless hours into refining his fellow “Mighty Five” composers’ music posthumously, such as Borodin’s Prince Igor opera and Mussorgsky’s opera, Khovanschina, even to the extent that it deeply cut into his own creative time. His 1887 “Capriccio Espagnol” and, a year later, the dazzling Scheherazade, came after a lengthy absence of composing, a self-described period of low creativity (see #8). Which goes to show that sometimes writer’s block can be a blessing in disguise, because when you return, boy, do you return. By having a naval career, visiting exotic ports of call, not to mention harboring a lifelong love of the sea, he was able to skillfully recreate all of it musically, resulting in harmonies, textures and sounds infrequently heard in Western classical music up to that point. All of which is resplendently depicted in Scheherazade. This entry was posted in 10 Things, Classical Music and tagged 10 facts about Rimsky-Korsakov, Balakirev, Ballets Russes Scheherazade, Borodin, Capriccio Espagnol, César Cui, Composer of Scheherazade, Farukh Ruzimatov, Flight of the Bumblebee, Fokine's Scheherazade, Gimnazija Kranj Symphony Orchestra, John Neumeier's Nijinsky, Ljubljana. Slovenia, Mariinsky Ballet Scheherazade, Matjaž Bogataj, Michel Fokine Scheherazade, Mussorgsky, Nadezhda Rimsky-Korsakov, National Ballet of Canada, Nejd Bečan, Nikolai Rimsky-Korsakov, Rimsky-Korsakov, Rimsky-Korsakov’s Scheherazade, Russian composers The Mighty Five, Scheherazade, Svetlana Zakharova, the Golden Slave, Théodore Canillé, Valery Gergiev, Vaslav Nijinsky, Voin Rimsky-Korsakov on May 15, 2018 by admin.